Dec 27, 2007 was a really cold day in Idaho, two days after Christmas. But it was our really cold day two days after Christmas. Little feathery snow-flakes fell around us and the ground and trees shimmered with bright white snow. 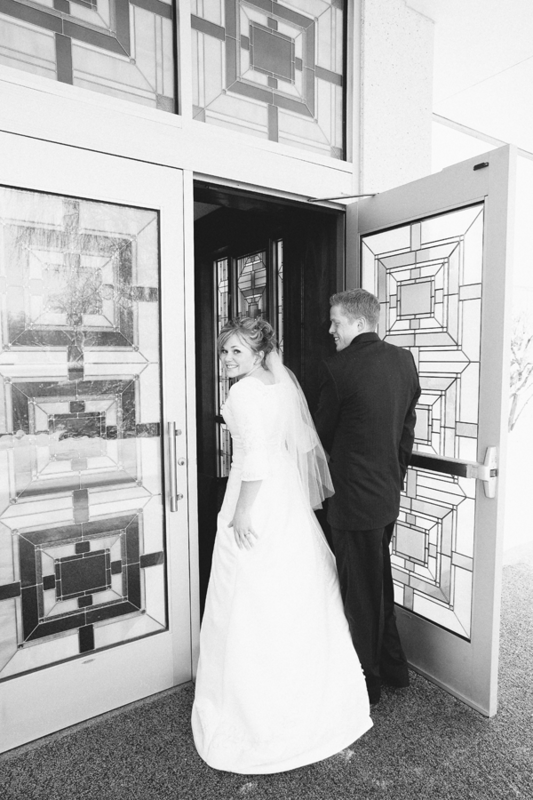 And we giggled like nervous little crazies as we walked through those doors because we knew that it meant forever... But really, we knew it was a forever thing long before that day, so I think those giggles might have been excitement and not really nerves at all. I'm crying. and dead. you are so cute together. this is so so so cute. with warmth, love, and snuggles. you two are adorable. enjoy the heck out of your anniversary!! Happy Anniversary friend!! You two sure made a stunning bride and groom! I love that he wore brown - works so well with his hair/skin tone. Love is the best!! Have a very happy anniversary! Your guys' love story is so beautiful. I love that families can be together forever. It is such an amazing thing to know. Also your wedding dress is so sweet. The arm length is just darling. These are beautiful! Congrats on five years! That's so exciting! Oh congratulations! This post is beautiful - my hubby and I are at 1.5 years. Can't wait to hit the big 5! You guys are adorable! Happy anny!